Separated Combustion Models: HDS45 and HDS75 are used in areas where flammable materials and sawdust are present. Will be shipped set up for natural gas or propane depending on your selection. You will choose your gas type when you add the heater to your shopping cart. are only sold in Natural Gas. If you order propane you will be sent a natural gas unit with a propane conversion kit. Certified for residential, commercial and industrial use. Attractive low-profile design and neutral paint scheme assure that Hot Dawg will blend inconspicuously into any garage decor. Durable polyester powder paint maintains life-long good looks. Standard power exhaust simplifies side wall or roof venting with small diameter vent-pipe. Versatile design allows for right or left hand piping and installation. 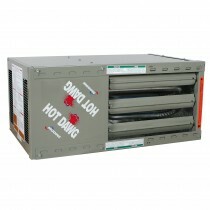 Gas, electrical and flue connections can be changed from one side to the other by simply flipping the Hot Dawg over. Installs easily from ceiling with only two angle brackets (included). Designed for Natural Gas or Propane Gas. Sealed, permanently-lubricated motor for trouble-free dependability. 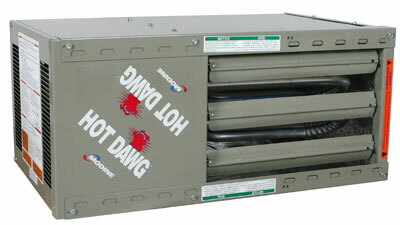 Full 10-year warranty on heat exchanger.